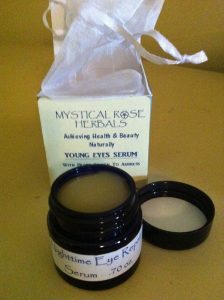 This fabulous, toning Eye Serum contains an array of herbs that tone the skin, reduce puffiness and this fast-acting, all natural Eye Serum even reduces dark circles! All natural and certified organic ingredients. See results quickly! Apply just before sleep or even under makeup in the morning. AMAZING RESULTS – FAST!